Carnegie: Magic Detective: RICKY JAY MOVIE IN D.C. For One Week! 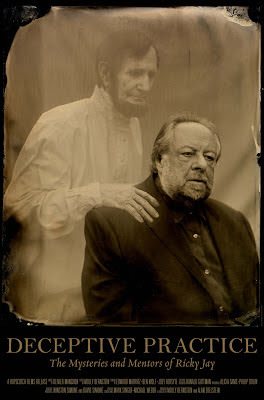 RICKY JAY MOVIE IN D.C. For One Week! Co-Directors Molly Bernstein & Alan Edelstein will be there In Person Friday, June 28 at 7:15pm & Saturday, June 29 at 4:45pm. If you're coming to town to attend the SAM National Convention, you might want to give yourself time to go see this movie, I would suggest arriving a day early. The following description of the movie comes directly from the theatre website. Deceptive Practice: The Mysteries and Mentors of Ricky Jay is a mesmerizing journey into the world of modern magic and the small circle of eccentric geniuses who mastered it. At its center is the multitalented Ricky Jay, a best-selling author and historian, an acclaimed actor (House of Games), a leading collector of antiquarian books and artifacts, but above all a conjurer capable of creating a profound sense of wonder and disbelief. Deceptive Practice traces the story of Ricky's achievement, from his precocious apprenticeship in Brooklyn, beginning at age 4, with his grandfather Max Katz, as well as Al Flosso, Slydini, and Cardini (all among the best magicians of the 20th century), to his extraordinary one-man shows on Broadway. Friends and collaborators appear, such as David Mamet and Steve Martin (who joins Jay in a hilarious turn on a vintage '70s "Dinah Shore" TV show). Throughout, Jay demonstrates live on camera his mastery of sleight of hand. Viewers will gain not only a deep appreciation for the arduous and arcane demands of the magician's craft, but also for the colorful use of language and storytelling central to the art.